Excelitas Technologies® Corp., a global technology leader focused on delivering innovative, customized photonic solutions, introduces X-Cite® 120LEDBoost to replace their popular X-Cite 120LED broad-spectrum solution. With the same key features and mercury-free benefits as its predecessor, X-Cite 120LEDBoost delivers 40% more power for improved fluorophore excitation. Its innovative design includes intuitive controls with long life LEDs, to deliver peace of mind and simplicity to researchers across the globe. 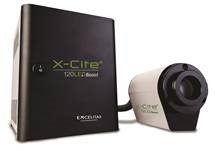 A versatile illumination choice for fluorescence microscopy, X-Cite 120LEDBoost provides high-power, broad-spectrum fluorescence excitation from 370-700nm, catering to a wide range of popular fluorophores and fluorescent proteins. The 40% power increase in the 500-600nm region of the spectrum provides stronger excitation for fluorescent proteins such as mCherry and other popular red fluorophores, which are generally challenging for LED illuminators. The product’s advanced direct coupling optics ensure bright, uniform illumination when using microscopes from all major manufacturers. Direct Coupling without Vibration: The innovative thermal management design of X-Cite 120LEDBoost allows direct coupling to the microscope for maximum power without adding mechanical vibration. Electronic shuttering provides sub-millisecond operation while avoiding the vibration and failure risk of mechanical shutters. Electronic Shutter and Silent Thermal Management: Fanless, high-output LED head design and lack of shutter noise make for virtually silent operation, providing an optimal work environment for microscopists, and enabling maximum precision in vibration-sensitive imaging experiments. Multiple Control Options for Maximum Flexibility: X-Cite 120LEDBoost offers complete automation for multi-day time-lapse experiments and simple ergonomic manual control via speedDIAL. Its LED instant ON/OFF capability also limits photobleaching and phototoxicity with ultra-fast PC control or TTL triggering. X-Cite 120LEDBoost can be driven by commercial imaging software, and an SDK is available for developing customized control solutions. Ergonomic Fingertip Control: The fluorescence solution’s ergonomic speedDIAL can be placed where it is most comfortable for individual users. Additionally, X-Cite 120LEDBoost’s speed-sensitive intensity dial doubles as an ON/OFF button for quick, intuitive illumination control.